[00:06] The Romiosyne of the City [i.e., Constantinople] is a part, a section, of world-Romiosyne, among which we are numbered. However, we are in no way simply a piece of world-Romiosyne. We are, I would say, even if we are speaking about ourselves, a select piece of world-Romiosyne, for here beats the heart of our people [γένος]. It is the womb of our people. It is our Ecumenical Patriarchate. From here extend the ideals and values of our people, the glory of our people, the sufferings and martyrdoms of our people, their source is here. From here we serve worldwide Orthodoxy, we contribute to pan-Christian unity, we contribute to the peace of the whole world. [*cross-talk*] As I was saying, in any event…. [*cross-talk*] No, this didn’t bother me. I said it so I could continue with what I will say. [02:00]…at this time our Patriarchate is working hard to solve the ecclesiastical matter of the Ukraine and displays the privileges and rights which it has from the canons of the Ecumenical Councils. And these canons of the Ecumenical Councils—and, indeed, that of Chalcedon [*gesturing towards the Metropolitan of Chalcedon*], the fourth Ecumenical Council, which gives the specific privileges of appeal to the Ecumenical Patriarchate—these canons are binding for the whole of Orthodoxy. Whether or not our Russian friends like it, sooner or later, they will follow the solution that the Ecumenical Patriarchate will provide, because they do not have another option. [2:45] Recently, our brother, [the metropolitan] of Prince Island showed me an article by Alexander Massaveta—who, as you know, lived here for many years and wrote very nice books about Constantinople—and the title of this article that the Elder of Prince Island recently showed me is ‘The Ecclesiastical “Brexit” of Russia will Come Back to her Like a Boomerang’. I saw it and was struck—I believe it, for all the developments of the situation are in our favor. Certainly, there are articles that are underhandedly paid for by the Russians. The dark propaganda of the Russians has as its object, as its ‘victim’, if you like—in their eyes, for we ourselves are never victims—in their eyes, it has as its aim the Ecumenical Patriarchate, because our Slav brothers can’t stand the precedence that our Ecumenical Patriarchate has, nor, consequently, our people in worldwide Orthodoxy. 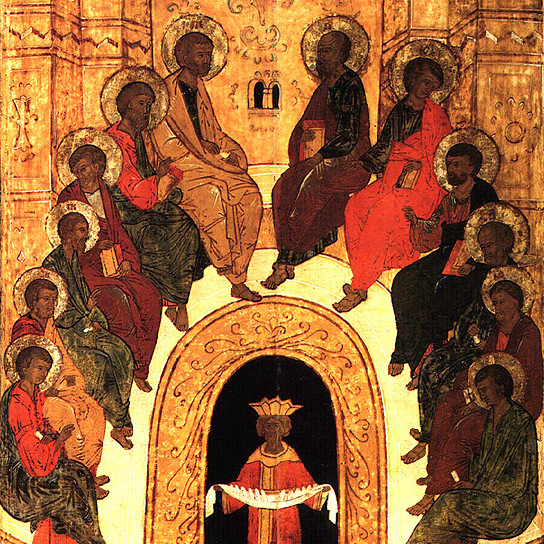 [03:55] I am made proud by this, I keep this in mind, and I try in my everyday struggle to maintain these privileges and these rights, with which God’s providence, through the decisions of the Ecumenical Councils, has crowned the all-august Ecumenical Throne, the first-seated church of Orthodoxy. [04:18] Your [bishop] [*inaudible*] the goodness to remember and memorialize the twenty-seventh anniversary of my election as Patriarch. During these twenty-seven years, I was never alone—I had the holy hierarchs as companions, as coworkers, as helpers, and the people of God—all of you, here and in every place to which the jurisdiction of the Ecumenical Patriarchate extends. All of us together have passed these twenty-seven years serving the Mother Church, Christ, and all the ideals the values of our people, the values common to all humanity, the particular ideals that we have as a race [φυλή] and as a people, and thus we continue down the road of our fathers’ destiny. [05:15] Personally, I have tried these years to honor the votes of my holy brothers that set me upon the Ecumenical Throne, so that I not go against anyone’s expectations, that I show myself to be just, because when someone attains a particularly high place of honor, using the responsibilities and the authority which this honor gives him, he may be unjust, he may make mistakes. For my part, if mistakes were made—and certainly, they have happened—they were not intentional; it is human weakness that allows for mistakes to take place. I always have calm in my conscience; I said this recently in a talk to some pilgrims from Patra, and it was published in the press. There was an article, or at least one that came to my attention, from Serres, saying “What is this, that the conscience of the Patriarch is calm, since he has done this and that with Ukraine?” etc., etc… God gave us two ears [*laughter*]: these things come in one ear and go out the other. Glory to God. [06:30] Now, because today I see Eleni here, and, earlier, Rena, the nieces of Patriarch Demetrios, I want to say that, this morning, we held a Trisagion for Patriarch Demetrios in particular, and for all those who came from Twelve Apostles [parish] in Feriköy [a neighborhood in Istanbul, marking 150 years since its founding, the members of which are the audience of these remarks], in whatever role—proistamenoi, assistant priests, cantors, sextons, etc….teachers, all who served this community, going out into this world. We did the Trisagion properly, and we remembered them. I, however, would like to personally remember with particular gratitude and emotion Patriarch Demetrios, because he honored me, for over twenty or so years—as well as during his patriarchate—he had me to his right like his right hand (I say this with pride), and with his paternal love he covered all my shortcomings. I learned much by his side. I learned love and simplicity, kindness. I tried to imitate him and apply these things in my life. But always, when I pass through the different places of the Patriarchate, I feel as though I will see him there before me—this is how connected we were during his twenty years of his Patriarchate, when I was his personal secretary. So, I remember him personally in a special way, personally, with special gratitude. [08:15] As for my anniversary tomorrow, I ask your prayers. By your prayers God will grant me health and endurance—for however many years He wishes. Our life is in His hands. He is our creator, He is our provider. And whatever good we have in our lives, we believe it comes from above, “coming down from the Father of Lights”, who is the very same: our Heavenly Father. [08:45] So that we might have unity and love between us, as a community [ομογένεια] , we have our nation [έθνος] close to us, in the person of the [Greek] Consul General’s representative. Even if she has only recently taken up her duties, we wish her from now abundant success in them. We are grateful even from now, because the first signs that she has given are that she will be close to us in all our problems; for their solution, she will stand with us, she will help with our unity, in our interactions, our very survival, because the problems that we have as a very small minority here are well-known. Many times, they are predictable, many times they are unexpected and unforeseen, but we always count on your support, most noble lady Consul General. I thank all of you for your attention and your participation. I share in the joy of the Feriköy community. Previous Carol Saba: Speak Now… Or Forever Hold Your Peace!